What's better than buying one Bonne Bell Lip Smacker at a time? Buying a whopping eight of them! While I was back in the lovely Cleveland, OH for the weekend -- my beautiful grandparents celebrated their 60th anniversary!! (check out the picture below of them on the big day!) -- I made a stop at CVS with my mom and brother. I've been in the market for some new Lip Smackers for awhile now, and no matter where I seem to look in NYC (Duane Reade, Walgreens, CVS, Ricky's, you name it), I just haven't been able to find a single, solitary tube. But the CVS in Cleveland had one of the greatest inventions I've seen in a long time -- the Bonne Bell Lip Smacker Originals 8 Piece Party Pack! 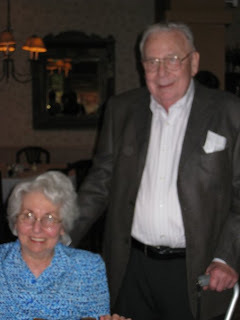 My wonderful grandparents celebrating their 60th anniversary! My new favorite is definitely Mango. It's sweet without being cloying or overbearing, and it leaves my lips smelling and tasting fantastic for hours. I'm totally digging every flavor in the pack, though -- especially since I now have enough for my purse, bathroom vanity, desk, kitchen counter, coffee table ... okay, you get the point. In case you're not near the CVS in Cleveland, you can get your own for $8.95 on Bonne Bell's website. Now these are lip-smackin' good. Bonne Bell is the best! Maybe they're more available in the Cleve because BB is headquartered in Lakewood, just to the west of Cleveland? Regardless, they are the best! If anyone is every there when they have their bi-yearly warehouse sale -- go! Lip Smackers for a quarter! Happy Anniversary and congrats to your grandparents. 60 years of wedded bliss is almost unheard of nowadays. katieavmsdirector -- Yay for the Cleve! Next time we're back there, we are SO hitting up that sale.